Sorry that's the best I could do with Snowdrops - a Flowering of Forsythia was easier. 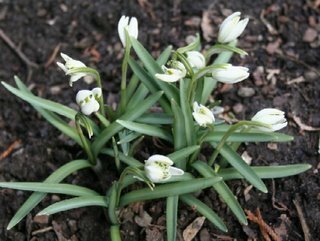 Anyway we take our highs where we can get them and these are the first flowers up in the garden. Actually they were up about the second week in March; but it turned cold again, so I had to wait for it to warm up to take pictures. I love flowers and I love knitting floral themes. 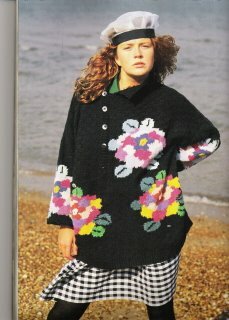 I remember the beautiful intarsia flower sweaters from Susan Duckworth and others in the late 80's and early 90's. I was talking to a store in Massacheutts a while ago and she said, "Oh, nobody 's doing intarsia these days." What a pity! You miss out on the fun of sweaters like these. Maybe I'll try an floral coffee coat for a little reminiscing. Coming soon are some rather fantastic coffee coats. Be sure to let me know if you have any to offer: info@infiknit.com will get to me. I am almost finished my refining of coffee cats so that pattern will be on its way here soon. I apologize for the brevity of this post. I am moving Infiknit's web site to new software and I am busily entering patterns - just 750 to go. They couldn't do an import apparently, so I am spending every spare minute typing - with time out for a little knitting when I can't see the screen anymore! The picture is from "Susan Duckworth Knitting" published by Century Hutchinson 1988. I think that intarsia is due for a come back!